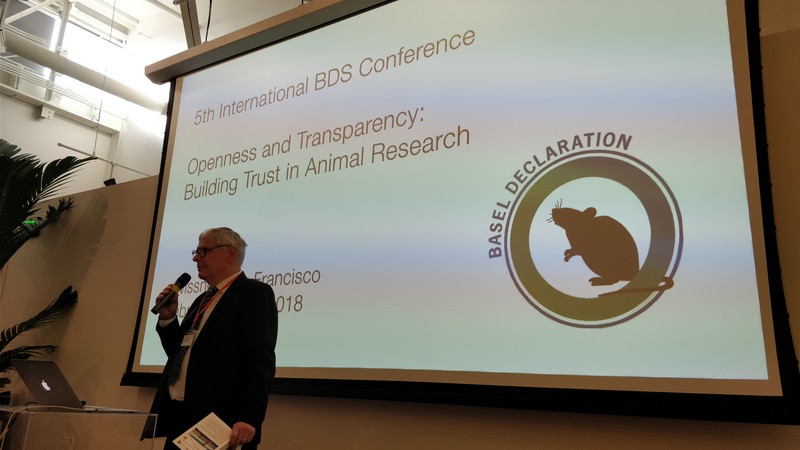 On February 14-15th 2018, scientists, veterinarians, communications staff and administrators from Europe and North America gathered in San Francisco to discuss “Openness and Transparency: Building Trust in Animal Research” at the 5th Annual Conference of the Basel Declaration Society (BDS). Below is a brief summary of the talks given on the 14th. The event was kicked off with a welcome from Rolf Zeller, President of the Basel Declaration Society, and other key organisers, Paula Clifford (AMP / SR), Sheila Fakurnejad (Swissnex) and Matt Bailey (FBR / NABR). Matt noted that the decline in animal rights extremism, and the shift in activism “from extreme activities to public policy activities” meant that it was time to “stop operating based on fear” and instead get the research community to increase their own efforts of transparency and openness. Professor Dario Ringach (UCLA) gave the first of the morning speeches, looking at the morality of animal research. Dario posed a question that he believed all those involved in animal research must be able to answer: “Why is it ok to harm animals to advance science and medicine?” You can read more about Dario’s answer to this question in his Symposium article in the American Journal of Medical Sciences where he argues our unique abilities to challenge the causes of human/animal suffering creates a moral imperative to act. Professor Bill Newsome (Stanford) explained the important role of non-human primates to research. He looked at examples including Deep Brain Stimulation and Brain-Machine Interfaces. With so much about the brain we still do not understand, Bill believes that the use of primates will become more important over time – as the use of smaller mammals has significant limitations for the advancement of neuroscience. It is worth remembering, he added, that primates are 20 million years of evolution closer to humans than a mouse. Dr Larry Carbone (UCSF) discussed frankly what motivated institutions towards both greater, and lesser openness. Fears of being targeted, concerns about bad press, time and effort, and the “someone else’s problem” effect all contributed to many institutions choosing not to talk openly about their animal research programmes. Larry also discussed how there are many reasons institutions are already open, including FOIA laws, published papers, website news articles and whistleblowing policies. Larry also gave a shout out to the Lab Animal Tour created by Understanding Animal Research as an example of excellent openness by institutions. Dr Margaret Snyder, from the Office of Extramural Research at NIH, gave an overview of how NIH embraced openness through its different information outlets. This included through the NIH website research news and the RePORTER tool – though it was questioned how easy it was for the general public to navigate. Interestingly, Margaret noted that over 50% of all their FOIA requests about animal research came from animal rights groups rather than the public or journalists. Professor Stefan Treue (BDS) looked at the many myths about animal research that needed to be busted – that it is “torture”, “useless”, “profit-driven” or “not applicable to humans”. He also pointed out that in order for these myths to be debunked, the scientific community has to get over some of its own myths: that open discussion of the subject only brings negative attention; that criticisms and doubts of animal research should not be discussed in case they are misused by activists; that scientists will be targeted for speaking up; or that science communication is the responsibility of organisations not individuals. Importantly, Stefan noted that the existence of national organisations (like FBR, UAR), should not be used as an excuse by scientists or universities to not communicate about animal research. Stefan was also the first of a number of people to mention the Speaking of Research list of animal research statements – saying that while it showed examples of good practice, it also showed the need for more institution to speak up. Wendy Jarrett, Chief Executive of Understanding Animal Research, spoke about the UK’s history, from the days of radical extremism, to the current period of transparency, culminating in the Concordat on Openness on Animals in Research. Wendy was the first, but not the last at the conference, to suggest that a US-version of the Concordat might provide a framework to greater openness in the US. Speaking about the 18-month process of developing and launching the Concordat, Wendy noted that UAR had to garner the support of top-level officials in some of the largest biomedical institutions in order to bring this effort to fruition. The Concordat has helped bolster public support as institutions that engage in more proactive outreach on the issue can generate positive media coverage on the use of animals. Kirk Leech (EARA) began his talk by noting that the decline in animal rights extremism in the US had given rise to slick PR-oriented animal rights groups. He further noted some of the risks that animal rights groups have posed to organisations transporting lab animals. Kirk noted that animal research transportation represented only a tiny portion of airline income, and that it was up to the research community to present an ethical case to convince airlines that they should be involved in transporting research animals. Tom Holder (Speaking of Research) spoke about the falling support for animal research in the US (see graphs below), as well as increasing opposition. He suggested that the Concordat on Openness on Animal Research in the UK may have contributed to the US avoiding the same trends in support and opposition. His talk revolved around why individual institutions benefitted from engaging in greater openness noting: the positive media publicity it can bring in; it can pre-empt many FOIA queries; it can build resilience and responsiveness within an institution; it helps engage with difficult journalists and media; and it helps prevent animal rights groups portraying animal research as secretive. Tom went on to note that improving the website information is an activity any institution can do to improve its openness on the issue. Servan Grüninger (Reatch) focused on how to talk about animal research in blogs and news stories. Essential components included knowing your audience, identifying and finding the root of the disagreement, and coming up with positive suggestions on how to address their concerns. By acknowledging the reality of animal research – that harm to animals is involved among other things – it removes the argument from your opponent and instead turns it into a point of discussion. Ann Turner (AALAS) rounded off the presentations by giving an overview of AALAS’s activities. This included a multitude of websites such as the AALAS Foundation and the Kids4Research websites. Among their most popular resources has been their “Animals in Medical Discoveries” poster which details the Nobel Prizes and the animals involved in them. The talk gave many organisations ideas for how they might add to their own outreach materials. 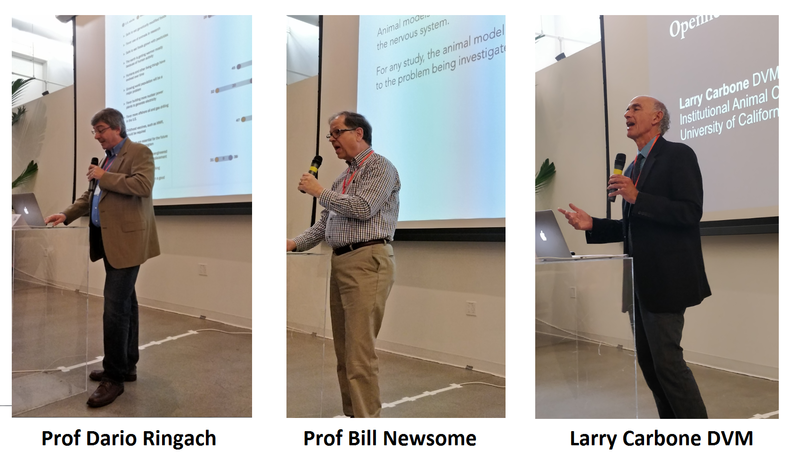 These speeches led well to the workshop section of the conference, where attendees would move into groups to write position papers on openness for the Basel Declaration Society. We will discuss these in greater detail in our next post. Previous Previous post: Research Roundup: Considering the bleak future of animal research without primates, heroin vaccine brought one step closer to availability and more!